By Michelle Cohen Corasanti, Garnet Publishing, 2012, paperback, 348 pp. We first meet 7-year-old Ichmad Hamid in 1955, as he guides his father through a field of landmines in the West Bank of Palestine to retrieve what’s left of the boy’s tiny sister Amal. As the household prepared for a holiday celebration the toddler climbed out of her crib to follow a red butterfly into their field—which Israel has designated a “Closed Area.” Ichmad guides his “baba” using a map he drew as he watched Israeli soldiers plant mines in the family’s land. I’m not giving away the plot. Amal is killed in the first three pages ofThe Almond Tree, and that heartbreak is only the first of many catastrophes to rock this young hero in his painful coming-of-age journey. Ichmad is a gifted boy who works to keep his family together amid the senseless cruelty and overwhelming hardship that is everyday life under Israeli occupation. Along with Ichmad, the reader learns that Israeli settlers can push his family off their land, move into his home, and divert water to build a swimming pool in the illegal settlement he can watch from his favorite almond tree. Soldiers can destroy every hut or tent that shelters Ichmad’s family—but nothing can force this Palestinian, or his artist father, to give up their dreams for a normal future. As Ichmad steadfastly retains his dignity, decency and resolution and tries to make something of his life, he also discovers friends, including a Palestinian teacher who prods him to pursue his studies, Israelis and Americans, who offer helping hands along the way. A Spanish journalist, Guillermo Fesser, who lives in Rhinebeck, NY, first sent me The Almond Tree, along with his glowing book review published in Spain’s Huffing­ton Post. In his note he mentioned, “I believe this book could be a useful tool for Americans understanding the conflict, since it is not a political book. 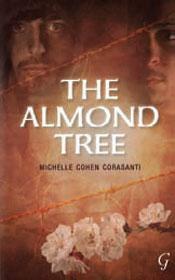 It’s fiction...which just happens to be in the context of Israel/Palestine.” He was so impressed by the novel that he’s created The Almond Tree Project, <thealmondtreeproject.com>, with a goal to use the arts—music, film, theater and storytelling—to promote dialogue, awareness and understanding. Fesser’s website helped answer my biggest question after I read the book: Just who is this first-time author, with a decidely un-Palestinian name, who has the storytelling gift, not to mention the chutzpah, to tell an authentic-sounding Nakba story through the eyes a Palestinian boy? It turned out she has her own important coming-of-age story. After a summer studying Arabic, Corasanti went with a friend to Walden Pond. Some Palestinians overheard them speaking Arabic, and it turned out one of them had lived in her same dorm at Hebrew University. They knew the same people and had the same birthday—although he was five years older. “It was love at first sight,” Corasanti recalled. He was doing his post-doctorate at Harvard with a Nobel Prize winner. In the end the two didn’t marry, as we can guess by her married name. Although Corasanti had the seed of her story, she said she buried it for 15 years—until she readThe Kite Runner by Afghan-American author Khaled Hosseini. “One might say it was a defining moment and I decided that I wanted my kids to know that I had seen injustice and tried to do something about it.” No U.S. publisher would touch The Almond Tree, but Garnet in the U.K. took a chance. This story would now be a screenplay for a guaranteed blockbuster if its hero, who endures and overcomes so much, came from anywhere but Palestine. Corasanti’s tale of resilience, hope and forgiveness is a must-read both for those who are stumbling through the Israeli-Palestinian minefield for the first time, and others who know its sorrows all too well.